Take the charakter (Â) away. (11-28-2015, 04:37 PM)Airic Lenz Wrote: Take the charakter (Â) away. When I first tried to compile, thi error appeared but I could not see this character. Then I clicked Tools -> Fix Encoding and Reload. Then the strange character appeared on line 189. I deleted this character, saved the file, tried to compile again, but the same error appeared again. And the loop goes on. The strange characther does not exist when I try to open the .ino file on notepad. Arduino: 1.6.7 (Windows XP), Placa:"Arduino Due (Programming Port)"
"Mostrar saída verbosa durante a compilação"
habilitado em Arquivo > Preferências. 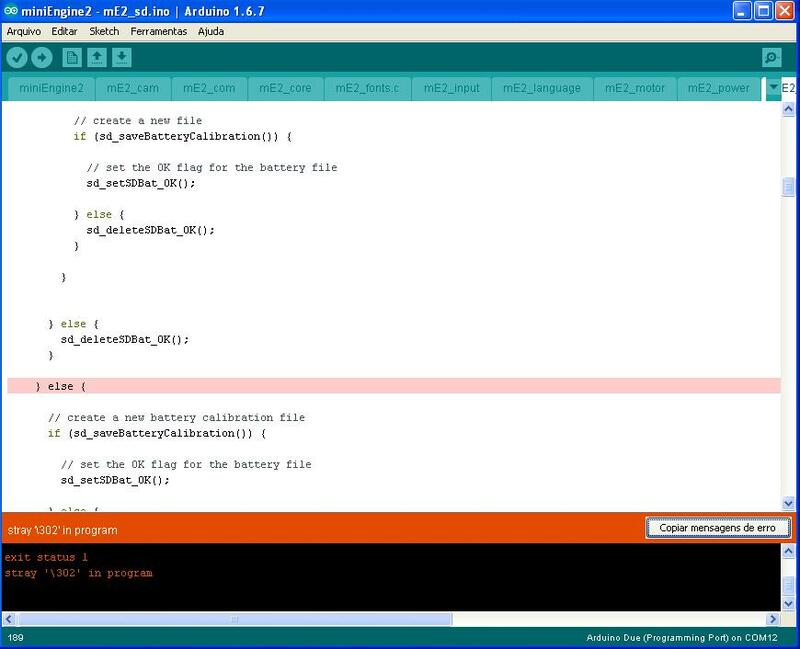 EDIT: Looks like the reason of this error is Arduino software version. I was using v1.6.7. I unninstalled it, and installed version 1.5.8 Beta. No problems appeared anymore, it compiled and uploaded ok with this older version. Current time: 04-24-2019, 09:32 PM Powered By MyBB, © 2002-2019 MyBB Group.